* If your flight lands in Casablanca, please contact our office, we can provide an airport transfer from Casablanca to Marrakesh. 150 miles (240 km) / 3 hour drive. The following airlines serve Menara Airport: Air France, Atlas Blue, British Airways, EasyJet, Iberia, Royal Air Maroc, Ryanair and Swiss Air. Day 3  The day will be devoted to exploring Morocco’s most famous imperial city, which is also known as “The Pearl of the South”. In the morning we will visit the Bahia Palaxa, Saadien Tombs, and the Koutoubia Mosque. Afternoon for exploring the souks (local markets); where you can find the largest traditional Berber market in Morocco. Day 4  Morning departure. Our next destination is Azib N’Arous in Ait Bougumez valley, Central High Atlas. We will drive through the El Haouz plains, stopping to visit the famous Ouzoud waterfalls, then we will reach the stunning Ait Bougmez Valley, where the hike begins. Passing beautiful mud-brick villages and plenty of lush valleys we arrive at our destination, Azib N’lkiss, where we will spend our first night camping. Day 5  Today we will cross our first pass, Tizi N’Oughroy at 11,482ft/3,500m. Our hike will be in an area frequented by nomads with beautiful surrounding views. After a short descent to Tarkedit, at the foot of Mount M’goun, we will stop to spend the night. Day 6  Today we will climb the second-highest mountain in Northern Africa, Massif M’Goun (13,346ft/4,068m). The ascent is not technical but the trail is steep. This will be long day of rugged mountain hiking. We will be rewarded with breathtaking views of the Saghru Mountains, southern Morocco and the Rose Valley. The descent will take us to the small village of Oulilimt where our camp will be waiting. Mules will have transported our gear to camp and it will be set up when we arrive. Option: If you do not wish climb the M’goun summit, you may accompany our muleteers to our next camp. The hike is not difficult. It is 5 to 7 hours long, following a mule trail and climbing a 10,170ft/3100m pass. Day 7  We begin our descent from Oulilimt, trekking through valleys and arrive at Ait Atta. We then hike up the Tizi N’ait Imi pass and descend to reach Ait Imi, a village in the Bougumez Valley where we will spend the night in a guest house. Day 8  Our journey to the heart of the High Atlas Mountains begins. 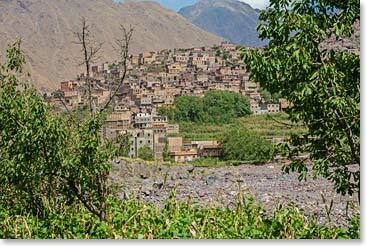 Our destination is the village of Imlil in Toubkal National Park. We will spend the night indoors in a Kasbah. Day 9  We begin hiking through valleys with captivating scenery typical of the arid Atlas Mountains. Before reaching our camp at the foot of Toubkal we will stop at the marabout (tomb) of Sidi Chamharouche, the saint of the valley, whom the town is named after. This popular place for Moroccan pilgrims to visit is located at 7,544 ft/2,300m. We will hike from here up a steep path to reach our refuge at the base of Toubkal. Day 10  SUMMIT DAY! We will begin in the early morning up the boulder paths. The climb is not technical but will present us with some rocky and steep terrain. Once we reach the summit of Toubkal Mountain at 13,671ft/4,166m we will have rewarding views from the Sahara to the Marrakech plains and up to the surrounding peaks of the Atlas Mountains. We will descend back to Neltner Refuge for a night of rest. Important note: On occasion local weather conditions may require the trekking route to be altered.